This year's 16+1 Leaders' Meeting between the Central and Eastern European countries and China, which Croatia is hosting on Thursday through Saturday, has a few distinct differences from its predecessors. First, unlike last year when the China-EU Leaders' Meeting was held after the 16+1 meeting, this year Chinese Premier Li Keqiang went to Brussels for the meeting with European Union leaders first. Second, for the first time the 16+1 Leaders' Meeting will not be held in a CEE capital, but in Dubrovnik, "the Pearl of the Adriatic Sea". Third, this meeting may be the last 16+1, since Greece has been invited to join to form a 17+1. Although the main theme of the Dubrovnik meeting is "openness, innovation and partnership are building new bridges", the China-EU meeting may cast a shadow over those endeavors. Contrary to last year, when in the joint statement released after the meeting, EU officials referred to China as a strategic partner, not only in terms of trade but in improving "the rule based international order", this year the EU may be less cordial. French President Emmanuel Macron said on March 22 that the time of Europe being naive has passed and the EU is determined to introduce strict and unique rules in dealing with China. Words warmly welcomed by those opposed to China. Although, it should be noted that only four days later, Macron said that both France and China consider multilateralism as the best means of promoting international cooperation under the current circumstances of multiplying risks and mutual challenges. Those who are puzzled by this change of heart should look to the fact that France concluded a contract worth 40 billion euros with China. It is very likely that, after the Brussels meeting, China will offer more viable opportunities to Central and Eastern European Countries. Criticism can be summarized as the unfulfilled expectations of the 16 CEE countries that China would somehow solve their financial difficulties. Certainly, without questioning China's economic strength and remarkable growth rate, one should not consider China as having some magic powers, there is a lot of work that should be done solely by the CEE countries themselves. There is room for strengthening cooperation by expanding investment and financing channels aimed at developing mutually beneficial projects that are not exclusively in the infrastructure domain. There are lots of other areas that can be improved to boost cooperation between China and the CEE countries. 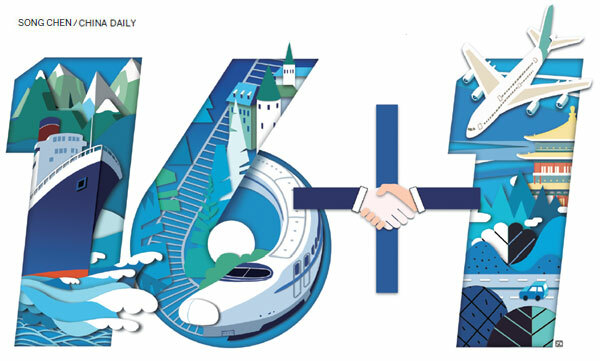 It is in the interests of China and the CEE countries to continue insisting on a win-win strategy that will secure the more fruitful goal of successful implementation of 16+1 cooperation within the wider Belt and Road Initiative. It seems that the main obstacle to this is the prevailing mentality of the 16 CEE countries that constantly object to a unified approach in their relations with China. Yet insisting on particularity will cause more damage than benefit, a common approach toward China by the CEE countries is necessary to fully tap the potential of cooperation. In spite of different cultures, traditions and mentalities, the CEE countries urgently need to adopt a common cooperative strategy toward China. The Dubrovnik Summit is an opportunity for the CEE countries and China to build bridges not only of iron and concrete, but also bridges among people, built of fruitful ideas and directed toward a shared future. The author is head of the Regional Belt and Road Center of the Institute of International Politics and Economics in Belgrade, Serbia. The author contributed this article to China Watch, a think tank powered by China Daily. The views do not necessarily reflect those of China Daily.